Are you ready to deal with the aliens? Visit all enemy camps, but don't forget to get ammunition and upgrades. Earn money from kills and spend them on upgrading the equipment. 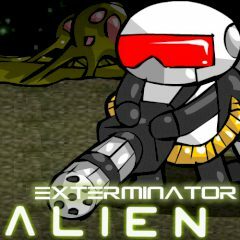 Get ready to kill some aliens during the hard day. distract for a couple of minutes and stop the invasion. Start at the middle camp and clear all alien locations on the screen. Get ammunition, purchase upgrades and advanced weapons. Be ready for ambushes and other unexpected things. Deal with the aliens and get back to replenish your equipment.